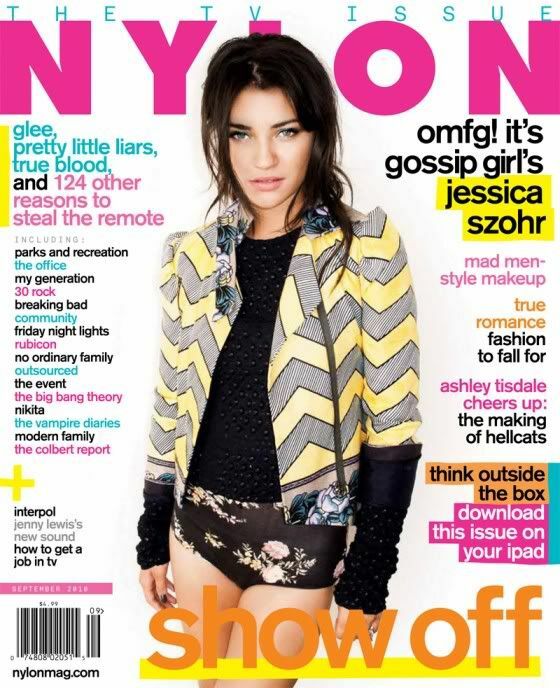 oving these shots of Gossip Girl's Jessica Szhor from Nylon Magazine's newest issue. She is so mindblowingly gorgeous & really can pull off crazy pulled-together fashion combinations. Do you ever mix up two different trends/styles? I never really watched Gossip Girl (I know I know, so sue me) but when I did, she was ALWAYS my favorite. I think it's her edgy-ness that attracted me.. too much of that pretty bs gave me a headache. She seriously can pull off anything. and when I said "pretty" I definitely meant "preppy" haha damnit! Ah she's so gorgeous!! I love her mixmatching outfits, but I don't think I could pull it off as well as she. This makes me want to buy Nylon now! Jessica is by far my favourite member of Gossip Girl. She's so pretty and really has amazing style. I love these pictures of her. She looks great as 90's glamour grunge. Jessica looks gorgeous in these pictures :) Love the fashion mashups! Love the puffy sleeves on the striped top!